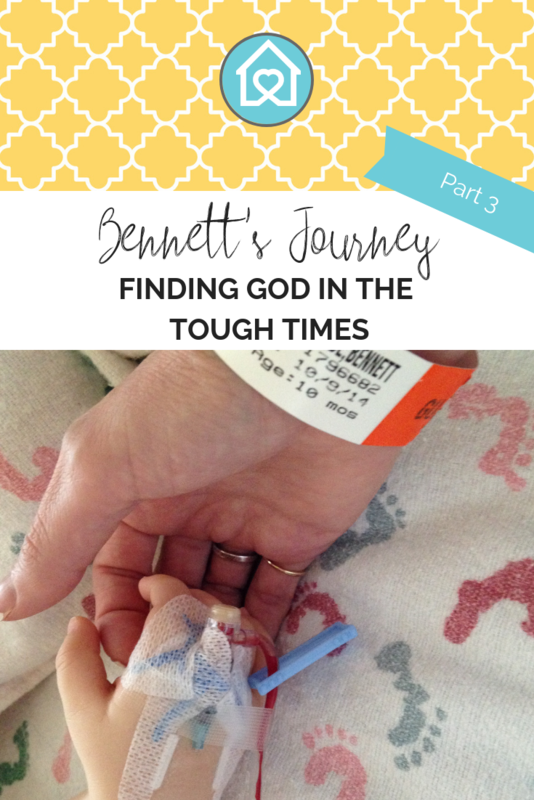 This month I have taken some time to share our journey with Bennett’s Craniosynostosis Diagnosis and what I learned about Trusting Your Momsense but now I’d like to share one of the most important lessons I learned through our journey. This lesson proved to be perspective shifting and life changing in many ways. The crux of this lesson was precisely this…God is there in the tough times and God cares about even the small things. Despite what our hearts may feel, or our mind might struggle to make sense of, the truth remains. We can and will find God in the tough times. Let me share an incredible way God winked at me during this whole ordeal. We found out in late June that Bennett needed the horrific surgery, which would entail an incision ear to ear to expose his little skull. They would remove, reshape, and replace portions of his skull during this six-hour surgery. Now each mom handles this information differently. 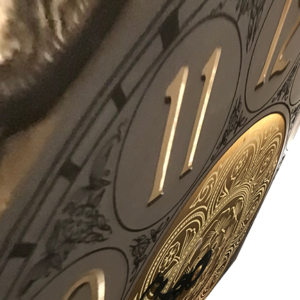 Some want all the intricate details and others choose to not pursue the ugly details and just deal with the bare necessities. I guess I chose something of a combination. I pursued all the details, as horrible as they sounded and then had to decide when I needed to call it quits on all the information gathering and just process what I really needed to focus on. The wait between surgery and diagnosis was dreadfully long. I knew exactly what would be done to my tiny precious baby and had done all the Google researching to find photos of it. I struggled to get the graphic images from haunting me at night. At some point, I had to put those images to rest and choose to pursue the peace of God that I knew would settle my aching mother’s heart and tired mind. At times, I just felt it was horribly hard. We had never encountered anything like this with our six other kids. This was really going to involve some stretching and growing us as parents. And of course, we had six kids watching our response and learning in the process. No pressure there! The weeks leading up to surgery had their ups and downs. I snuggled little Bennett every chance I had. And while it felt scary to think that such an invasive surgery would take place so close to his little brain, we worked hard to exercise some trust and faith in God’s protection and His ability to equip our doctors (since we were praying desperately for them as well!). The day before the surgery, we had to go to Denver for pre-op details and tasks. As we were preparing to leave home to travel to Denver, we gathered all the kids to pray together for Bennett, the doctors, and the surgery. It was during this prayer time that God spoke the sweet words of Psalm 139 tenderly to my heart. So, after praying, I read that passage to the kids. I relayed that this was a great reminder that none of this had taken God by surprise. He had created Bennett. He knit him together in my womb and how well he knew him! He knew Bennett’s every move, and even the very numbers of hairs on Bennett’s head! And as much as we loved Bennett, we had to know that God loved him even more! I wanted very badly to remain calm for Bennett’s sake. I guess that felt like a great motivator—don’t let him feel your stress. Let him feel your calm! But boy was that a challenge. My husband and I went out to eat dinner, though neither of us was remotely hungry. All we could do was look at little Bennett and our eyes would well up with tears! We spoke with the anesthesiologist by phone that night and asked about the possibility to hold Bennett and take him back to surgery. He told us this was not customary at this age, so he would have to do some checking. Not exactly the answer I’d hoped for, but better than a quick no! 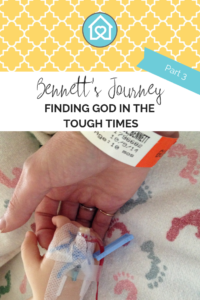 To hear how that resolved itself, be sure to read the first story about Bennett’s journey. That too was quite a moment in our journey! 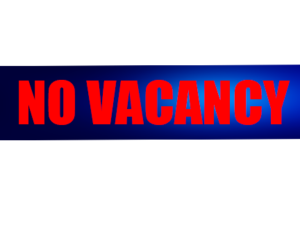 Therefore, we headed to the hotel, and after extensive last-minute searching for an open room, (who would guess that a closed airport nearby would cause every hotel for miles to be booked on this night!) we found our quiet place for the night. My mind was racing with all the details of when to feed him, when to nurse him, when to wake him, when to be at the hospital, and yes, even all the details I had researched and wanted to forget! I lay in bed and snuggled Bennett closely that night. What I was really wanting was to know somehow that God knew and cared about what we were going through. I thought of the verse that He had put on my heart earlier in the day. But very swiftly, Satan had already tried to cast doubt upon that. Maybe that wasn’t really assurance at all. What if you are doing the wrong thing to even do the surgery and not let him be the way God created? Don’t you just hate when Satan does that? He takes a good sweet God wink and tries to cast doubt, worry, distraction, or anything negative in the way of it. He is a sly mean thing! Then, as I lay there that night, I was really wanting reassurance and peace of God’s presence in this moment. As I was updating Bennett’s Facebook group (our way to keep prayer warriors posted! ), I received a message from a family friend that I had not seen or spoken with for many years. She had several special needs kids and has been through several difficult surgeries with them. She said she always liked finding a passage of scripture that was meaningful to her or offered peace and put their little footprints on that passage. Then she could look at it during surgery and feel some reassurance. What a great idea! I wish it wasn’t late at night, in a hotel room with no ink pad! 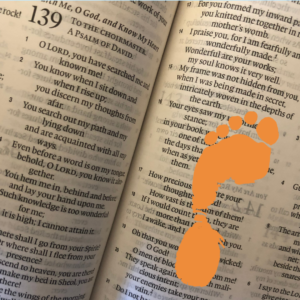 I wonder if I could talk my husband into leaving the hotel a little earlier to stop by Walmart and get an orange washable marker, so I could put his footprint on Psalm 139?! Considering we had such an early check in time, last-minute and hungry-baby schedule to work around, and travel time, I figured I better not stress the morning with one more seemingly silly request of my husband. I mean justifying to him my need to stop and get an orange washable marker on this big surgery day!? 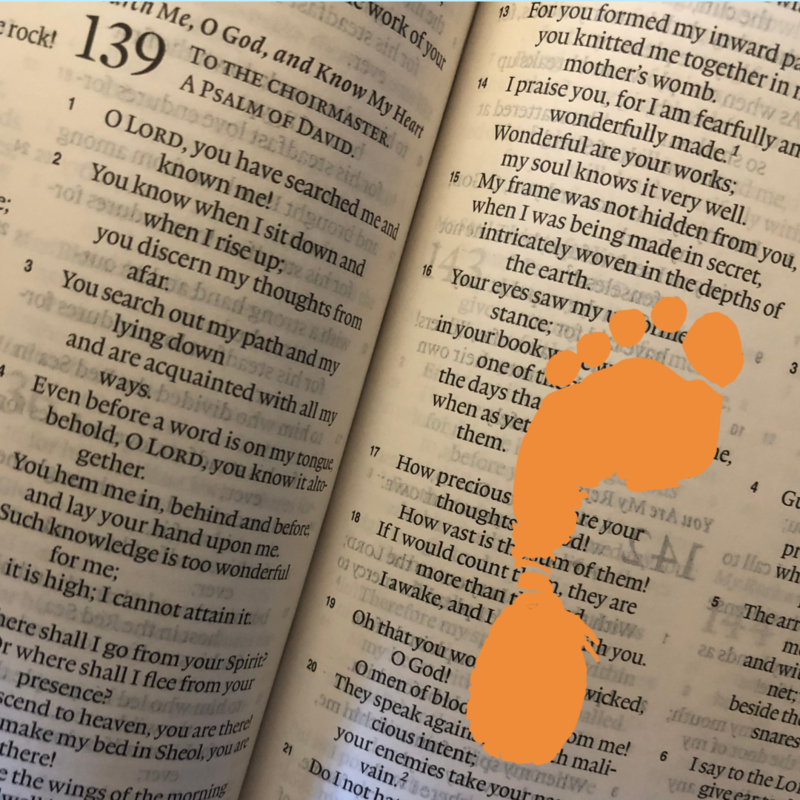 You couldn’t possibly imagine my surprise when an image pops up and get this…a TOTAL God wink…it was Psalm 139 with an ORANGE baby footprint on it!!! Now I don’t know about you, but to this day, I get goose bumps and teary eyed to think that in that very moment God knew my heart. He knew the smallest of details or wishes that I had not even spoken out loud! Tears filled my eyes as I realized the depth of His love for me. It cast away all doubt, all distraction, and all worry. He was here. He was with me. He was with Bennett. And oh, how He loved us! Even down to the “seemingly silly” requests! I put him down gently on the surgery table where he would lay for the next several hours, smoothed back his hair, and kissed his little cheek. I took a long whiff of my baby, as we had never been apart for this amount of time ahead. “I love you, Sweet One.” And as I turned and left the room, I was not panicked, or fear driven, instead, I felt the calm assurance of God’s presence and angels surrounding him. Whether big or small, God was in it all! God guarded and protected Bennett. He guided the hands and minds of the medical team that surrounded Bennett. He did great during surgery and recovered remarkably well for what had been done. This was yet another time in life where God proved himself faithful. In our home, we started a special little project. We have what we call our Blessing Box, which is like a brown treasure box. When we experience a time in our life where God shows Himself in a very real and special way, we add something to the box to remember it. 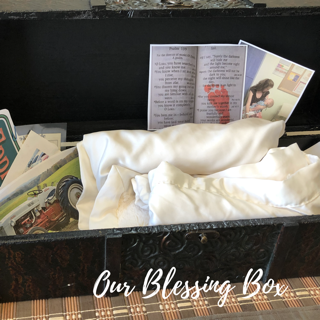 Afterwards, we added to our Blessing Box a photo of Bennett sleeping in my arms, leading right up until surgery time and a picture of the orange footprint on Psalm 139. Whenever we look through this box, we are reminded of all the special ways God hears our prayers or provides and it will be a great memoir for years to come! This, my friends, are who we are finding God in the tough times. And I don’t ever want my kids to question if He really does care. I want them to have many reminders of how we’ve seen Him before. Finding God in the tough times, takes a heart that is open and receptive. It takes eyes that are not steadfast on things that distract or discourage but that can choose to fix their eyes on things above. It takes an honest and open approach to bleed your heart out about even the things that seem small and eyes that take in even just the little bits of reassurance that fall our way. 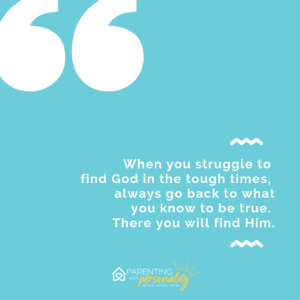 Finding God in the tough times does not mean the road doesn’t feel difficult, but that we are willing to grab hold of Him who makes it bearable moment by moment. It doesn’t mean we don’t wonder or question or doubt, but rather that we struggle through hanging on to what we know to be truth. Click & Tweet! Like a song I heard many years ago, “When you don’t understand, when you can’t find His plan, when you can’t trace His hand, Trust His heart.” And that is sometimes the stark reality. God’s will, plan, or ways may not always make sense but, what we do know to be true is His steady and unfailing love for us. During this difficult time, I found great assurance in God’s Word. When times get tough, it is helpful to go back to the things we know to be true. These truths can give us peace, joy, calm, strength, and assurance when we need those encouraging words to weigh in louder than our fears and worry. I had a good friend who designed pretty index cards with these verses and a neat design. She laminated them, and I put them all around the hospital room. I still use them three years later! I would like to provide a handy little reference guide to all my subscribers. 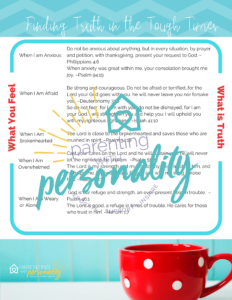 It is easy to subscribe, and you will receive free resources like this, helpful tips and more just click here. If you already subscribe just check your email for the direct link to open and download this pdf. It contains some of the scriptures I found helpful during this time. Maybe some of them will provide you peace or assurance when you need them most. Be sure to download the handout and pin the graphic for future reference!